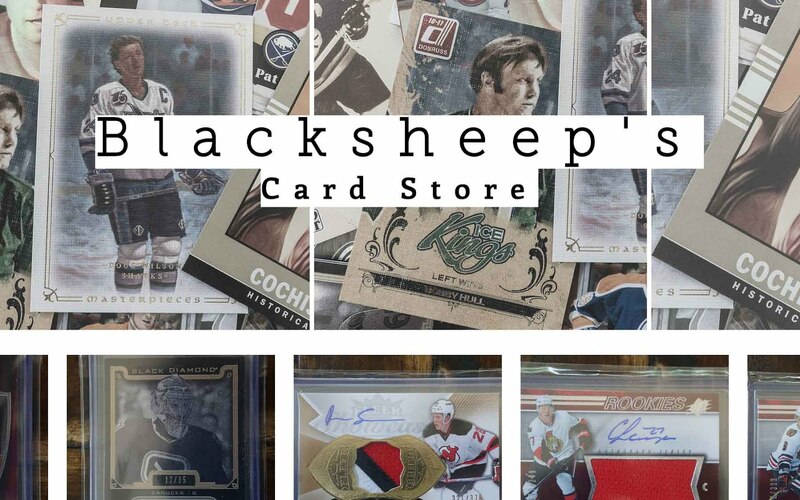 I haven't blogged a box break in a while since neither Upper Deck nor Panini have come out with any new products as of late. So here's a retro review until the next new product comes out! Upper Deck ICE came out last year before I started collecting cards. It is a product that is known for its Ice Premier rookie cards that feature see through acetate in its design. Unfortunately, this year UD has dropped ICE from its main line-up and has sneakily included it as a side bonus pack scattered throughout UD products. After getting my hands on a box of 09/10 ICE, I really wish it was a fully realized and released product this year rather than an aside. Black Diamond would have been my choice to put in as a bonus if I called the shots over at Upper Deck. I got my box of ICE from the Hobby Box. Chris, the owner, is a great card retailer and has many followers on Youtube that watch him break boxes. I've gotten a few boxes from Chris now and have been very happy with his service.This video above is him opening up my box of 09/10 ICE. It's funny when I think about the base cards for this set. Before this box I had NEVER seen what the base cards looked like. I had no clue. 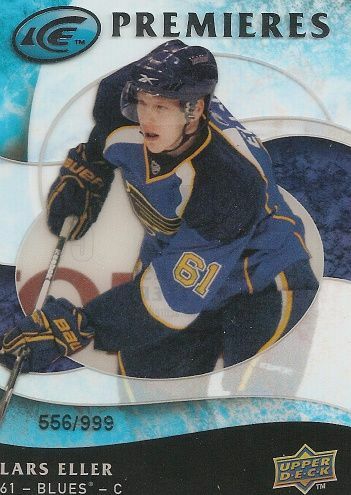 I had seen the Ice Premier rookie cards because they are always a hot ticket item, but never a base card. I had heard an opinion of them a while back that they were on cheap cardstock... so in my imagination, I had a picture of a very plain and boring card design on OPC-type stock. When Chris started breaking the box on Youtube for me I was totally surprised at how vibrant the base cards looked. They are very sharp and eye-popping. 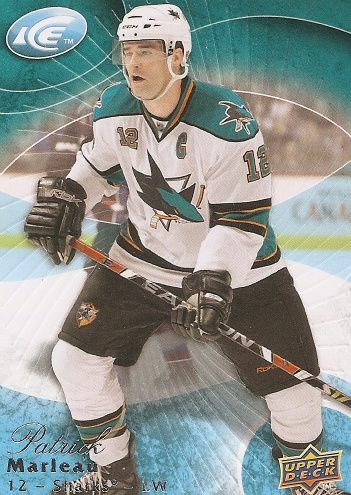 The above example of Patrick Marleau is a very pleasing card to me. The foil scripted first name is nice as well as the blue color scheme. On top of that, the cards have a textured front to give it a more three dimensional effect. Unfortunately, there is a red color scheme that I feel does not look nearly as good as this. If all the card were this blue color I would have been extremely pleased with ICE base cards, but they don't. And I guess that's ok since it's just my opinion... maybe other people out there like the other color schemes, but I think since this product is called 'ICE' there should be a cooler motif to compliment the name of the product. These Ice Premier rookie cards are a short printed part of the regular set. I think for most people this is THE reason to purchase ICE. The rookies come in different rarity levels with the best being a low print run of 99. 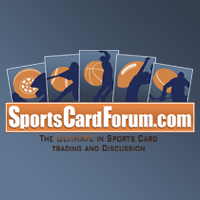 Rookie cards limited to 99 sell for big bucks! 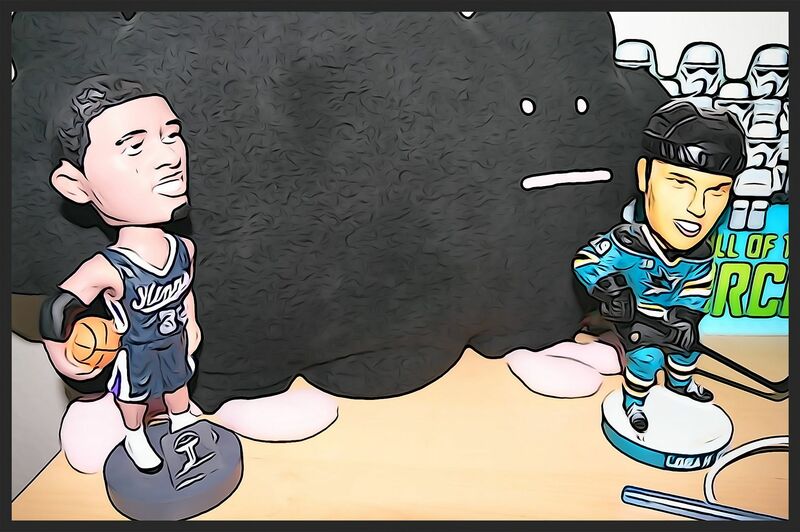 I recently was watching Ice Premier rookies of Logan Couture and they were easily going for around $150. You get a handful of Ice Premier cards per box, but getting a 99 one is pretty difficult. I really like the design of the 09/10 Ice Premiers. The acetate is a great touch because it fits in so nicely with the ice theme of hockey. The blue colors pair perfectly with these cards. I think they are just great looking cards - a really impressive effort by the UD design team. 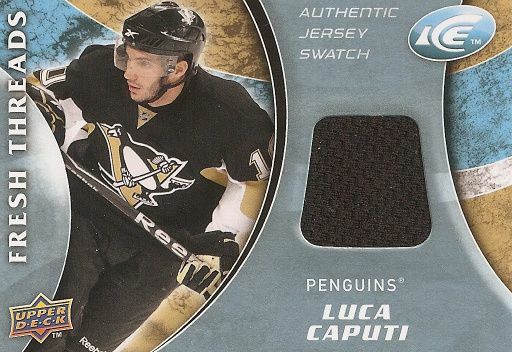 Aside from the Ice Premier rookie cards, there are no themed inserts in ICE other than game-used and autographed cards. This is nice because it means this product gets right down to business. Don't get me wrong - I think creatively themed inserts are great, but many people often go straight for the hits. Here is a typical memorabilia card out of ICE. It is hard to tell, but the area around the jersey swatch is in a subdued foil. Nothing too special here. Just a very generic jersey card. I think I'd be only happy to get these cards if they were of players I liked or of a star player. This one that I got I really don't know what to do with except to put in a box and take up some space. Maybe if I'm really lucky someone would want it in a trade. Hear that Luca Caputi fans?!?! This ones for trade!!! Sometimes you can pull some really sweet stuff out of ICE. There are memorabilia cards like this one that are very limited in number. This particular card is number 13 out of just 15 made. It features a nice sized piece of patch. I like this design much better than the Fresh Threads card above it. The design is more interesting and having the team color of the side makes the card stand out a bit more. I guess I was pretty lucky to land one of these cards. They are a rare find. 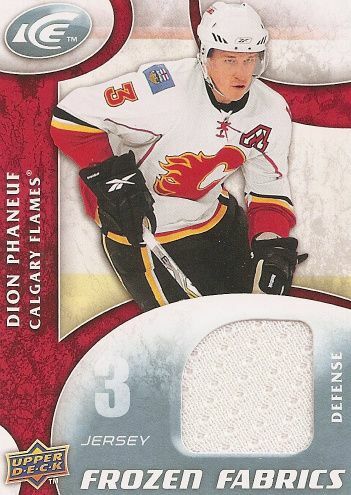 I also pulled this Dion Phaneuf Frozen Fabrics jersey card. You can see how the team color helps the highlight the card. My final hit in my ICE box was a Jennifer Botterill autograph card. This card is not technically an ICE insert card (UD put it throughout some of their 09/10 products), but it counted as my auto hit for the box. 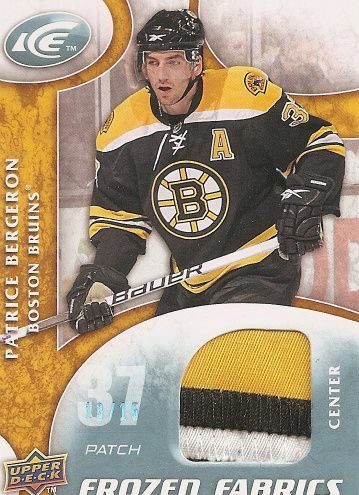 Many people do not like these cards because they do not feature NHL players. They actually feature figure skaters, Olympic athletes, and female hockey players like Botterill. But I actually like them. I think they are interesting cards and I like collecting them whenever I pull one. I'd rather have this than a no-name player for sure! I guess I got a pretty good box of ICE. My box had some pretty sweet hits in it - but according to people I talk to on the hockey card forums - this is not usually the case. I still think ICE is a very nice product. I really enjoy the thrill of seeing what Ice Premier rookie cards come out of boxes. I also like the fact that you can get some pretty rare memorabilia cards in ICE. I am very temped to get another box of ICE. It's a nice looking product that I feel is reasonable for its price. Boxes are less than $100 and who knows... maybe you'll get one of those Ice Premiers limited to just 99! whoa there... I like that set too... still trying to piece together the base set. Also, if you're up to trading that Botterill, lmk. unfortunately, the botterill is the only card i got from my break not for trade. everything else is though. yea... most people feel pretty negatively about the champions set. i think you and i are in the minority on this one.